NASHVILLE -- Tennessee has temporarily relocated all seven of its National Guard storefront recruiting offices to armories and is now accelerating handgun-carry permit applications for Guard members after last week's shooting attack in which five U.S. servicemen were gunned down at the U.S. Naval and Marine Reserve Center in Chattanooga. Among centers moved was one located in the same Lee Highway strip mall where authorities say 24-year-old Mohammad Youssef Abdulazeez began his deadly shooting spree. The move by Tennessee Gov. 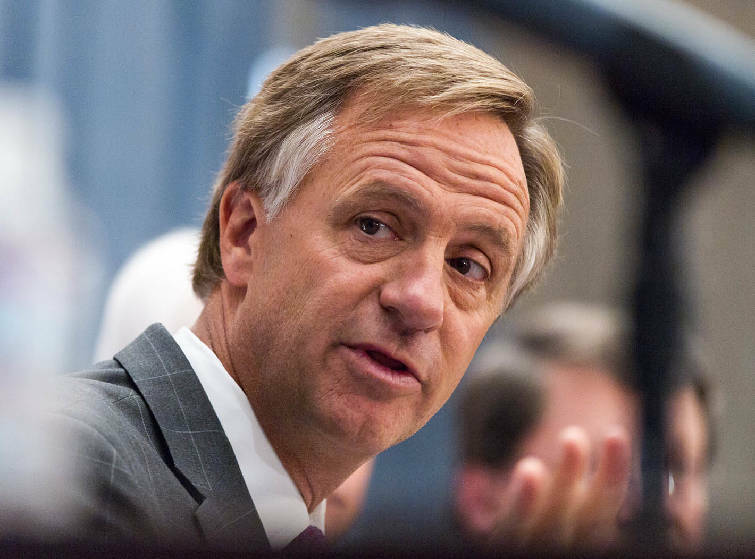 Bill Haslam came after a number of states on Friday and Saturday began ordering changes to their National Guard operations, part of a national reaction to the Chattanooga attack. The governor's office said Saturday in response to a Times Free Press inquiry there would be a review, then, amid some criticism, he announced more concrete plans Sunday. The administration said in a news release Wednesday that storefront state recruitment centers began moving Monday. "We have to make sure that we're doing everything we can to ensure the security of our guardsmen after what happened in Chattanooga," Haslam said in a statement. "We're continuing our review to determine the very best long-term security measures, but immediate efforts to re-position soldiers and help them arm themselves are appropriate next steps." Among other steps is sending U.S. Department of Safety and Homeland Security mobile units used for driver's licenses to armories to accelerate the issuance of handgun-carry permits. From Chattanooga to Washington, the vulnerability of soldiers at both state National Guard and U.S. Department of Defense installations has spurred heated debate over Pentagon policies on the arming of U.S. service members at state and military installations on American soil. In the meantime, a number of handgun-carry permit holders have turned up at recruiting stations from Murfreesboro, Tenn., to Ohio to stand guard. Recruitment centers especially are designed to be easily accessible and available to would-be recruits, hence the use of storefronts from Lee Highway to New York City's Times Square. A 1992 directive initiated by President George H.W. Bush, which took effect during President Bill Clinton's tenure, places restrictions on personnel's ability to go armed. Defense Secretary Ash Carter has ordered a review of the security policies. Meanwhile, Chris Cox, a Tennessee native who is head of the National Rifle Association's political and lobbying affairs section, has called it "outrageous that members of our armed services have lost their lives because the government has forced them to be disarmed in the workplace." In Tennessee, Republican U.S. Rep. Scott DesJarlais, R-Tenn., was joined by Tennessee's eight other congressmen and introduced a bipartisan bill on Monday in the House. It would allow Pentagon-designated U.S. military personnel with firearms training to go armed on military bases and other installations. And the issue landed squarely in the U.S. Senate Armed Service Committee's hearing on proposed new U.S. Army Chief of Staff Mark Milley's nomination on Tuesday. Responding to senators' questions, Milley said, "I think under certain conditions on both military installations and recruiting stations we should seriously consider it [arming soldier]." On Wednesday, DOD spokesman Capt. Jeff Davis told reporters the Pentagon won't change its policy that forbids most service members from being armed while on U.S. soil, saying "we do not support arming all military personnel," CNN reported. In a Times Free Press interview Wednesday, Richard Brennan, a decorated career Army officer who is a senior political scientist at the Rand Corp. think tank where he has continues to work with Pentagon officials, said it's not as simple a solution as it might appear. "If you were to talk to a wide range of military officers, they'd all suggest you need to be very careful when and where you arm military personnel," Brennan said. "When I talk to all my colleagues, and I talk to colonels and generals, everyone is concerned about moving too fast and having this knee-jerk reaction to arm everybody," Brennan said. On the other hand, he said, there is their desire to protect military members from threats. The discussion, he said, will center on how to secure military facilities without having service members armed and performing law enforcement functions.